Enjoy with a Powerful Sound 1000W DVD Home Theater System from LG. The DH6630T offers you Experience powerful bass through the specially tuned sound matrix. Bass Blast produces dynamic and deep bass sound quality. LG provides a solution with the Full HD Resolution Up scaler, which magically improves the resolution of the original content and makes it look great on the big screen as well. USB Direct Recording & Playback, to record CD tracks or FM radio programs on your USB, while listening at the same time. Enjoy your favorite music stored on mobile devices through the LG sound system with wireless audio streaming via Bluetooth™. 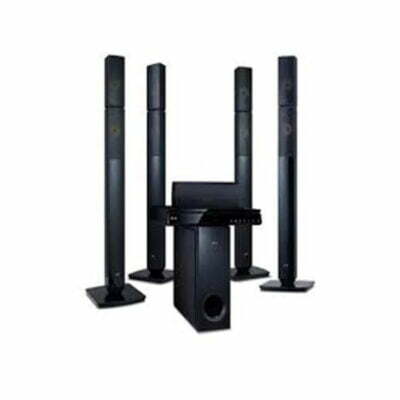 High quality entertainment & more fun thanks to karaoke function LG’s. One remote, total control. You can easily manage your entire AV system with SIMPLINK, which uses control signals transmitted through an HDMI cable. SIMPLINK is compatible with all LG products.